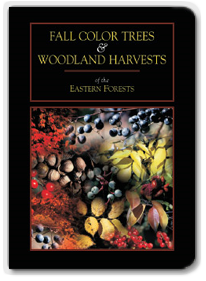 Full color photographs of 60 of the more common and colorful trees of the eastern hardwood forests. The common name, scientific name, range map, leaf silhouette, and scale for each species. 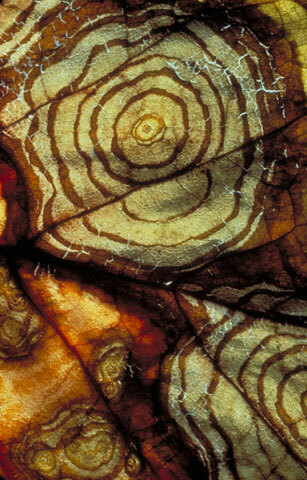 Commentary on shape and color variation in leaves and drawings illustrating leaf characters. A leaf shape/color index for quick reference. 240 full color photographs of 147 species of fall trees, shrubs, leaves and fruits of the eastern hardwood forests at their peak of fall brilliance. 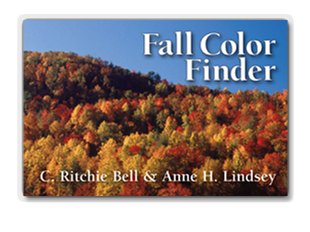 A concise explanation of how fall color occurs as well as where it is most varied. A distribution map, leaf silhouette, leaf character code, and the plant family for each entry. A separate glossary of terms, a leaf identification key, and an appendix with sources for fall color information. 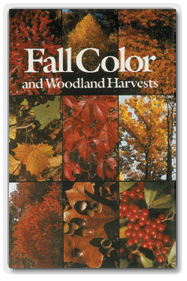 This DVD title includes two video productions, Fall Color Trees and Woodland Harvests. 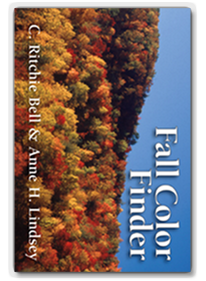 The 30 minute Fall Color Trees is a colorful and informative non-technical video for anyone interested in native trees, forests, or just fall color, and compliments the book, Fall Color and Woodland Harvests. The dramatic annual color change in the great hardwood forests of eastern North America - from rich uniform green to spectacular reds, yellows and browns - has often been called the "greatest show on earth." This video helps you get behind the scenes to become better acquainted with the maples, ashes, oaks, elms and hickories and to learn about the factors that produce the striking fall color from Maine to Georgia. Included is an introduction to why we have fall color and a presentation of the "greatest show on earth" with the treatment of 45 of our most common and colorful trees of the Eastern forests. The 60 minute Woodland Harvests provides a closer look at 112 species of fruits and their biologically important functions of seed protection and dispersal. Included are interesting past or present uses of our native and naturalized plants from food and fuel to medicines, wagon wheels, and industrial abrasives. Narrated by Charles Kuralt, this rich bounty of our eastern forests' harvest of grains, nuts, pods, burrs, nutlets, and berries is revealed. The harvest consists primarily of the vast annual output of fruits and seeds, but for some forest inhabitants, including humans, it also includes roots, stems, leaves, sap, and nectar. 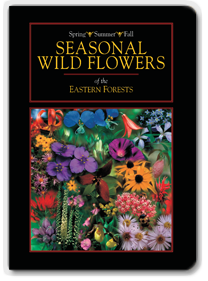 Seasonal Wild Flowers includes the three video productions, Spring, Summer, and Fall Wild Flowers of the Eastern Forests. Menus access species groupings by entry number for each of the three videos. Each of the seasonal videos begin with an informative introduction followed by descriptions of each wild flower species, all organized by family so that related plants may be more readily recognized and compared. Each numbered entry lists both the common name and family name, and includes an inch scale. Menus for each video provide quick access to entries by season. Rich resources are available in the extras including information on plant identification, plant families and pollination. This 52 minute video includes 100 of our most common, attractive, and interesting wild flowers and begins with the story of our earliest spring ephemerals that pop up under the leafless dormant trees in our woodlands and disappear by early summer. The Lilies, Orchids, Violets, and Buttercups grab the spotlight in this most popular of wild flower seasons. This 49 minute video introduces 80 of the attractive and varied native and naturalized plants of the summer months when the woodlands and forests are in full leaf - the green interlude - and colorful wild flowers are found along open roadsides and fields. Milkweeds, Mints, Beans, and Dayflowers take the lead in the longer, warmer days of summer. This 49 minute video presents 80 wild flowers of open fields and roadsides that provide masses of solid color in a spectacular finale before nature closes shop for the winter. Almost half of our fall wild flowers belong to the Aster family with colorful support by the Morning Glories, Gentians, Lobelias, and Jewelweeds during the shorter, cooler days of fall. Second in the "Take a Closer Look" series, this 26-minute video is a cooperative effort of Laurel Hill Press, the North Carolina Botanical Garden, and the Museum of the Cherokee Indian and tells the story about the relationship between the Cherokee and the plants that are a part of their world. The rich culture of the Cherokee is presented through vivid imagery of the land and people, the sounds of nature, and the sounds of the Cherokee, including their native language, their stories, and their music. The special stories of seven plants representative of the more than 800 kinds of plants used for food, clothing, housing, or medicine are told, first taking a close look at the plant as it lives in the natural world, then exploring the way in which the Cherokee people used and appreciated these native plants. Many members of the Cherokee community of the Eastern Band of the Cherokee Indian were involved in the production of this video. 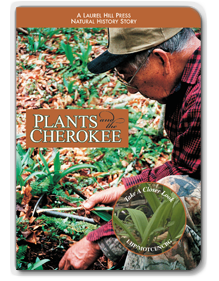 Pictured on the cover is Jerry Wolfe, Cherokee Elder, who explains how to collect Ramps. Walker Calhoun, also a Cherokee Elder, demonstrates use of the Blow Gun. Marie Junaluska, Tribal Council Member, speaks the opening text in Cherokee. Marie's daughter Nina, also helps with the language and appears several times. Freeman Owle tells several Cherokee stories, Eddy Bushyhead demonstrates use of the River Cane flute. The entire Crowe family, grandchildren and great grandchildren of Walker Calhoun, help illustrate many plants useful to the Cherokee.